Houry Avedissian strikes a triumphant pose dressed in a fluid gown reminiscent of a Greek goddess while standing in front of her Galleria project, a home she designed in the Hampton Park area. In a field dominated by men, this architectural designer is making a name for herself for her ultramodern designs. Photo: Paul Couvrette, Couvrette Studio. Fierce, proud and determined are some of the words Houry Avedissian uses to describe how she felt when posing for a photograph under a brilliant blue sky wearing saucy high heels and a gorgeous, flowing green gown. Standing in front of a home she designed, a small construction team can be seen in the background. Vivacious and tenacious, Houry is a one-woman show and has a knack for winning customers and housing design awards by pushing the envelope when it comes to creating ultramodern residential homes. With a proven track record, she is not to be underestimated and is a standout in a field—in Ottawa—that men mostly dominate. When she recently discovered a notable architect having a poke around the property of one of her current projects, she took it in stride and put it down to friendly competition. 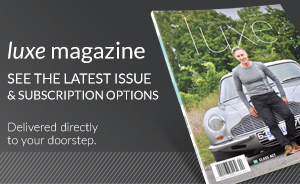 Always in motion and evolving, Houry arrived on the scene in 2009 as Ottawa’s shift from traditional to modern design was beginning to take root. 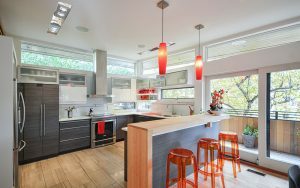 As homeowners clamoured for clean lines, serene spaces and sustainable green technology, slick designs featuring glass, steel and brick started cropping up on urban infill lots. 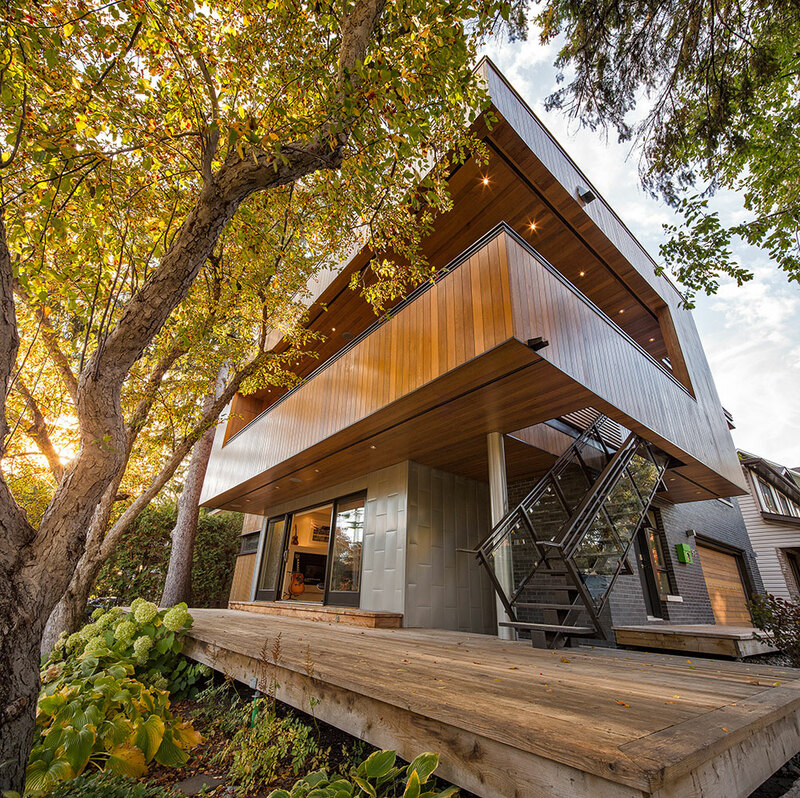 Built on a densely treed corner lot in Westboro and fondly referred to by Houry as her Treehouse design, the home is perched just high enough for occupants to feel like they are floating amongst the foliage as nature and architecture become one. Blending inner and outer spaces, and to enhance the treehouse effect, the home was built using several types of natural wood and is an experimentation of texture, angles and contrasting materials and volumes. 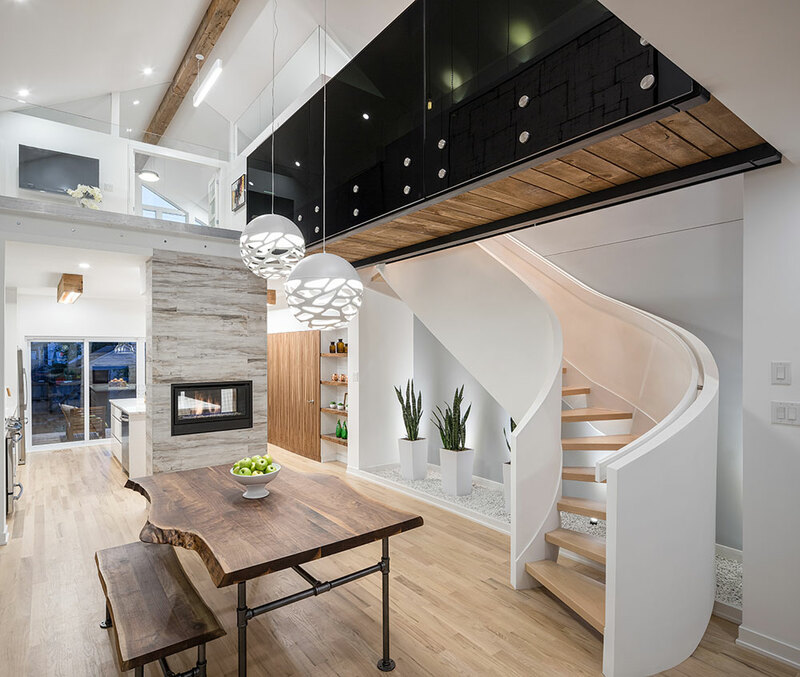 Visitors are invited to take their journey into the Treehouse via a custom steel, glass and concrete staircase to the open-concept second floor, where the kitchen, living and dining rooms flow seamlessly together and are divided merely by a see-through gas fireplace. This project, which was built by Binnette Construction, won the Western Red Cedar Sponsorship Award at the Wood Design and Building Awards, which draws competition from throughout North America. Photos: Justin Van Leeuwen. 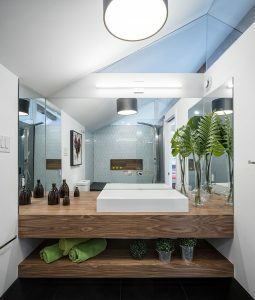 Houry’s Westboro project, dubbed the Treehouse, earned recognition and praise from her peers and won acclaim for the interplay between the exterior and interior of the home. It also highlighted her signature use of natural light, bold lines, woods, aluminum panelling, stone, glass and floating staircases and fireplaces. With an infectious passion for her profession—she admits to drawing houses and sketching dresses and gowns as a young girl—Houry continues to challenge herself and is setting her sights on making connections in Vancouver, Los Angeles and Miami. Affectionately named Stairway 2 Haven, this impressive Bayswater Avenue home captured four housing awards and boasts plenty of wow appeal, including a curvaceous and sleek staircase and a smoked-glass bridge connecting two halves of the second floor. Renovated in collaboration with Roy Nandram of RND Construction, the 1912 home was completely transformed from a one-and-a-half storey slender frame to a two-storey efficient and green marvel with a vaulted dining room ceiling, inviting kitchen with walnut cabinetry and shelving, a new laundry area and powder rooms and a stunning two-sided central fireplace. A spacious deck extends the living space outdoors, while custom wood screens offers privacy from nearby neighbours. Photos: Justin Van Leeuwen. Born in Australia and of Armenian descent, Houry moved to Montreal as a young girl and continues to spend time there each week with family. After suffering a brain hemorrhage at age 21 while a student at the University of Montreal, Houry overcame partial paralysis on the right side of her body and eventually returned to her architectural studies. She credits this experience with making her even more determined in her chosen path. 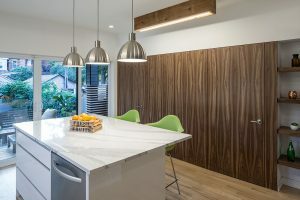 Ottawa remains her home base for work, and many of her custom projects can be found in the Westboro and Hintonburg areas. One of her current projects—her biggest to date—has been labelled the Infinity Residence after Houry walked around the lot on the banks of the Rideau River and envisioned an infinity pool at the back of the sweeping property. With a knack for decorating, Houry relishes helping clients furnish their homes once the building process is complete. A self-proclaimed fashionista, Houry was inspired by getting involved in the making of the green gown and is considering curating a fashion collection—the Ha2 line—based on the homes she’s designed.